As a former school teacher, I understand the challenges of teaching. Long hours, short pay — damned if you do, damned if you don’t. I remember being overworked and underpaid, so much so that I qualified for food stamps even though I didn’t take them. Of course, I would be the first to say that teachers deserve compensation for what many equate to a work of love, an act of selflessness – a calling, if you will. Even though I understand why teachers in Chicago (CPS) are striking, I think they need to focus more on the root of the problems as opposed to the quick-reform measures they are seeking. The prevailing rhetoric surrounding the strike is that Chicago’s teachers fail to see the forest for the trees. They’re striking within a system that needs an overhaul, not small reforms. The strike talk needs to expand, quickly to consider this factor. Teachers in Chicago Public Schools oppose Mayor Rahm Emmanuel’s proposals regarding pay, health benefits, and a new evaluation system. While many say the strike is hurting administrators and the mayor’s office, CPS students are taking the hardest hits. The privatization of schools through charters has caused major problems in Chicago. Schools closed, students got shifted, youth violence increased. Teachers didn’t author these conditions because truly the corporate reform movements are largely to blame. Who should the children receiving free and reduced lunch look to today, the fourth day they may miss a meal? Where should children without childcare spend their days now that summer programs have ended? From an outsider’s perspective (I live in California), this strike, which sees low-performing students missing valuable instructional minutes, seems to be about individuals, not the collective. Don’t get me wrong, teachers should argue for fair wages, push for small class sizes, discuss the length of the school day and determine a fair evaluation system. When folks see the educational outcomes CPS produces and then examine teacher demands, their position is severely weakened. Some strikers would say that they are advocating for systemic changes that go beyond pay and evaluation. Teachers need to add more counselors and social workers to the list. In addition to counselors and social workers, student assessment needs to be examined. The validity and reliability of standardized tests is debatable. Currently, it is the measure used for determining many things including promotion (student and teacher) so it does matter. Standardized tests cannot holistically measure student achievement and are not always indicative of teacher effectiveness either. If teachers don’t like the proposed evaluation system and they think tests do more harm than good, strike against high-stakes testing. School structure needs to be added to the list. Schools are still using antiquated models that actually impede 21st century learning—the new education craze. 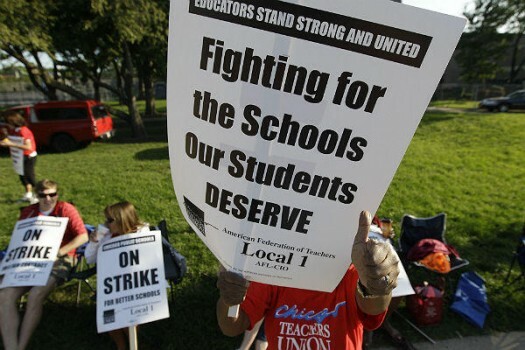 Strike to change the structure of schools, from the bells to the physical classroom settings. While we’re discussing classrooms, how about cultural incompetence? Teaching is made more difficult and the drop out rate is increased when students cannot connect to relevant curriculum and responsive teaching. Strike for curricular and instructional changes and development that allow teachers to connect with students. Let’s add the privatization of public schools to the list. Charters weaken the power of your union by decreasing the number of CPS teachers. They’ve also facilitated deadly consequences for Chicago’s youth. Strike against charter expansion. Let’s not forget poverty. Students sometimes come to the classroom lacking proper nutrition, with inadequate or no healthcare insurance and coping with traumas one can only imagine. Strike for fair and equitable social policies that affect your students’ lives and influence what happens in your classrooms. How can you think straight or focus if you haven’t eaten? Teachers and unions have the power to further the national dialogue around teaching and learning. This strike could mobilize us as a nation to ponder what’s best for students inside and outside the classroom. Teaching is a hard gig, which is why teachers should look beyond the quick reform options and focus on the roots of their concerns. Unions can be used to strike against policy and practice that make teaching more difficult and learning more arduous for kids. As it is now, this strike serves as a missed opportunity for all involved to move forward, together.